This article is about the novel written by Neil Gaiman. For the television adaptation of the novel, see American Gods (TV series). American Gods (2001) is a fantasy novel by English author Neil Gaiman. The novel is a blend of Americana, fantasy, and various strands of ancient and modern mythology, all centering on the mysterious and taciturn Shadow. The book was published in 2001 by Headline in the United Kingdom and by William Morrow in the United States. It gained a positive critical response and won the Hugo and Nebula awards in 2002. A special tenth anniversary edition, which includes the "author's preferred text" and 12,000 additional words, was published in June 2011 by William Morrow. Two audio versions of the book were produced and published by Harper Audio: an unabridged version of the original published edition, read by George Guidall, released in 2001; and a full cast audiobook version of the tenth anniversary edition, released in 2011. In March 2017, The Folio Society published a special collector's edition of American Gods, with many corrections to the author's preferred text version. In April 2017, Starz began airing a television adaptation of the novel. Bryan Fuller and Michael Green served as showrunners, and Gaiman is an executive producer. Fuller and Green departed the show after the first season. Shadow is an ex-convict who is released from prison three days early when his wife Laura is killed in a car accident. Shadow is devastated by her death, and is distraught to learn that she died alongside his best friend Robbie, with whom she had been having an affair. He takes a job as a bodyguard for a mysterious con man, Mr. Wednesday. Shadow and Wednesday travel across America visiting Wednesday's acquaintances and Shadow learns that Wednesday is an incarnation of Odin the All-Father. Wednesday is recruiting American manifestations of the Old Gods, whose powers have waned as their believers have decreased in number, to participate in a battle against the New American Gods – manifestations of modern life and technology, such as the Internet, media, and modern means of transport. Shadow meets a leprechaun named Mad Sweeney who gives Shadow a magical gold coin after Shadow beats him in a fight. Shadow tosses the coin into his wife's grave, inadvertently bringing her back from the dead as a semi-living revenant. The New Gods abduct Shadow (utilizing a group of shadowy Men in Black led by the mysterious Mr. World), but Laura rescues him, killing several Men in Black in the process. Wednesday hides Shadow first with some Egyptian gods who run a funeral parlor in Illinois, and then in the Great Lakes community of Lakeside. They are pursued all the while by the Men in Black, particularly Mr. Town, who blames Shadow for the death of his friends. The New Gods seek to parley with Wednesday, but murder him at the meeting. This act galvanizes the Old Gods and they rally to face their enemies in battle at Rock City. While retrieving Wednesday's body, Shadow is surprised to discover his old prison cellmate and mentor, Low Key Lyesmith, is working as a driver for the new gods. Shadow is bound by his contract with Wednesday to hold his vigil by re-enacting Odin's time hanging from a "World Tree" while pierced by a spear. He is visited by Horus, who is mad from living too long as a hawk. Shadow dies and visits the land of the dead, where he is judged by Anubis. Shadow learns that he is Wednesday's son, conceived as part of the deity's plans. During this time Mr. Town arrives at the World Tree, ordered by Mr. World to cut a branch from the World Tree. Horus finds Easter and convinces her to bring Shadow back to life. Shadow realizes Mr. World is actually Low-key (Loki) Lyesmith and that Odin and Loki have been working a "two-man con". They orchestrated Shadow's birth, his meeting of Loki in disguise in prison, and Laura's death. Loki had arranged for Odin's murder so that the battle between the New and Old Gods would serve as a sacrifice to Odin, restoring his power, while Loki would feed on the chaos of the battle. Laura chooses to hitchhike to Rock City and meets Mr. Town, who does not realise who she is, and they agree to travel together. During their travels Laura learns who Mr. Town is and, once they arrive at their destination, kills him and takes the branch. She then meets with Loki and manages to stab him with the tree branch which turns into a spear. Shadow arrives at Rock City and confronts Loki, now gravely wounded, and the ghost of Odin, who reveal their plans. Shadow travels to the site of the battle and explains that both sides have nothing to gain and everything to lose, with Odin and Loki as the only true winners. The United States is a bad place for Gods, Shadow tells them, and he recommends they return home. The Gods depart, Loki dies and Odin's ghost fades. Laura asks Shadow to take the coin from her and she finally dies. In Iceland, Shadow meets another incarnation of Odin, created by the belief of the original settlers of Iceland and much closer to the Odin of mythology than Wednesday. Shadow accuses Odin of Wednesday's actions, whereupon Odin replies that "He was me, yes. But I am not him." Shadow gives Wednesday's glass eye to Odin, which Odin places in a leather bag as a keepsake. Shadow performs a simple sleight-of-hand coin trick, which delights Odin and who asks for a repeat performance. Shadow then performs a small piece of real magic, pulling a golden coin from nowhere before walking away from the god and out into the world. Shadow Moon – An ex-convict who becomes the reluctant bodyguard and errand boy of Mr. Wednesday. Raised by his hippie mother who named him for a hippie-era song. Laura Moon – Shadow Moon's wife who died in a car crash at the beginning of the novel a few days before Shadow is due to be released from prison. Samantha "Sam" Black Crow – A hitchhiking college student Shadow meets during his journey. Chad Mulligan – A kind-hearted chief of police in the town of Lakeside. Mr. Wednesday – An aspect of Odin, the Old Norse god of knowledge and wisdom. Czernobog – The Slavic god of darkness, twin brother to Belobog, the god of light. The Zorya Sisters – The Zorya Sisters, relatives of Czernobog, are sisters representing the Morning Star (Zorya Utrennyaya), the Evening Star (Zorya Vechernyaya), and the Midnight Star (Zorya Polunochnaya). In Slavic lore, they are servants of Dažbog who guard and watch over the doomsday hound, Simargl, who is chained to the star Polaris in the constellation Ursa Minor, the "little bear". If the chain ever breaks, the hound will devour the world. Mr. Nancy – Anansi, a trickster spider god from Ghanaian folklore. He often makes fun of people for their stupidity, a recurring aspect of his personality in his old stories. Mr. Ibis – Thoth, the Ancient Egyptian god of knowledge and writing. He runs a funeral parlor with Mr. Jacquel in Cairo, Illinois. He often writes short biographies of people who brought folkloric beings with them to America. Mr. Jacquel – Anubis, the Ancient Egyptian god of the dead and mummification. He is an expert at preparing bodies for the wake at funerals. Easter – Ēostre, the Germanic goddess of the dawn. Mad Sweeney – Suibhne, a king from an old Irish story. Though not portrayed as such in his story, he calls himself a "Leprechaun", and is foul-mouthed, a frequent drinker, and taller than expected. Whiskey Jack – Wisakedjak, a trickster figure of Algonquian mythology. He lives near a Lakota reservation in the badlands with John Chapman, where he is mistaken for Iktomi, a trickster of their culture. John Chapman – Johnny Appleseed, described as a "culture hero" rather than a god. Alvíss - A dwarf in Norse mythology. Gwydion – Gwydion fab Dôn, a trickster god of Welsh mythology. Low-Key Lyesmith – Loki, the Old Norse god of mischief and trickery. Horus – The Ancient Egyptian god of the sky. Hinzelmann – Hinzelmann, a kobold who was formerly revered as a tribal god by ancient Germanic tribes. He protects the town of Lakeside, in the guise of an old man, by sacrificing one child each year. Mama-Ji – Kali, the Hindu goddess of time and destruction. The Jinn – an ifrit taxi-driver that swaps lives with an Omani businessman after a sexual encounter. Technical Boy – New god of technology and the Internet. Media – New goddess of television and pop culture. She appears in the form of Lucy Ricardo from I Love Lucy and various other forms. The Black Hats – Mister Road, Mister Town, Mister Wood and Mister Stone represent beliefs in conspiracy theories taking the form of men in black. They work as spooks for the new gods. The Intangibles – New gods of the modern stock market, the personification of the "Invisible hand of the market". Mr. World – Leader of the blackhats, new god of globalisation. The novel's dedication reads "For absent friends – Kathy Acker and Roger Zelazny and all points in between". The Terry Pratchett novel Small Gods explores a similar origin of deities. While Gaiman says that he did not read Pratchett's work, he thought they shared a world view due to their same geographic origins and, more importantly, daily phone conversations. He had also sought advice from Pratchett on resolving plot elements of American Gods. According to Gaiman, American Gods is not based on Diana Wynne Jones's Eight Days of Luke, "although they bear an odd relationship, like second cousins once removed or something". When working on the structure of a story linking gods and days of the week, he realised that this idea had already been used in Eight Days of Luke. He abandoned the story, but later used the idea when writing American Gods to depict Wednesday and Shadow meeting on the god's namesake day. About John James's novel Votan, Gaiman stated: “I think probably the best book ever done about the Norse was a book that I couldn’t allow myself to read between coming up with the idea of American Gods and finishing it. After it was published I actually sat down and allowed myself to read it for the first time in 15 years and discovered it was just as good as I thought it was”. In his introduction to Fritz Leiber's The Knight and Knave of Swords Gaiman acknowledges Leiber's portrayal of Odin & Loki had "definitely smudged into" and informed his take on the characters. While Gaiman was writing American Gods, his publishers set up a promotional web site featuring a weblog in which Gaiman described the day-to-day process of writing, revising, publishing, and promoting the novel. After the novel was published, the web site evolved into a more general Official Neil Gaiman Web Site. As of 2010,[update] Gaiman regularly adds to the weblog, describing his daily life and the writing, revising, publishing, or promoting his current project. 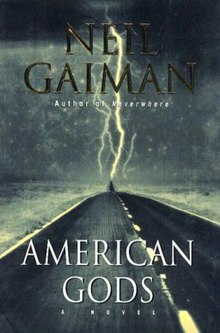 On 28 February 2008, Gaiman announced on his journal that for one month, the complete text of American Gods would be available to the public on his publisher's website. The book won the 2002 Hugo, Nebula, Locus, SFX Magazine and Bram Stoker Awards, all for Best Novel, and likewise received nominations for the 2001 BSFA Award, as well as the 2002 World Fantasy, International Horror Guild and Mythopoeic, and British Fantasy awards. It won the 2003 Geffen Award. In May 2010, American Gods was selected in an online poll to be the first "One Book One Twitter" book. The book was published in 2001 by Headline in the United Kingdom and by William Morrow in the United States. A special tenth anniversary edition, which includes the "author's preferred text" and 12,000 additional words, was published in June 2011 by William Morrow. The tenth anniversary text is identical to the signed and numbered limited edition released in 2003 by Hill House Publishers, and to the edition from Headline, Gaiman's publisher in the UK since 2005. The tenth anniversary edition marks the first time the author's preferred text has been available in wide release outside the UK. Two audio versions of the book were produced and published by Harper Audio: an unabridged version of the original published edition, read by George Guidall, was released in 2001. A full cast audiobook version of the tenth anniversary edition, including the author's preferred text and 12,000 additional words, released in 2011. A comic book series, American Gods: Shadows, was published by Dark Horse Comics starting in March 2017. A book of the same name, collecting issues 1 through 9 of the comic book series, was published by Dark Horse Books in February 2018. In March 2017, The Folio Society published a special collector's edition of American Gods, with many corrections to the author's preferred text version. Gaiman described it as 'the cleanest text there has ever been'. Starz developed a TV series from the novel with Bryan Fuller and Michael Green. The series debuted in April 2017. At the end of season 1, Bryan Fuller stepped down as showrunner and was replaced by Jesse Alexander. Fuller and Alexander had previously worked together on Star Trek: Discovery and Hannibal. Gaiman's next novel, Anansi Boys, was conceived before American Gods and shares a character, Mr. Nancy (Anansi, the spider god of African legend). In an interview with MTV News published on 22 June 2011, Gaiman said that he had plans for a direct sequel to American Gods. He had plans for a sequel even while writing the first book. He said he is likely to focus on New Gods in the sequel. In addition to the planned sequel, Gaiman has written two short story sequels featuring Shadow Moon. "The Monarch of the Glen", first published in Legends II, takes place in Scotland, two years after American Gods. The second short story, "Black Dog", was collected in Gaiman's Trigger Warning. It takes place a year later in Derbyshire's Peak District. ^ a b c d "2002 Award Winners & Nominees". Worlds Without End. Retrieved 5 August 2009. ^ a b c "American Gods: Is Nothing Sacred?". NeilGaiman.co.uk. Archived from the original on 9 May 2009. Retrieved on 13 June 2009. ^ Shepherd, Jack (20 March 2017). "Neil Gaiman gives verdict on American Gods TV series". The Independent. Retrieved 12 August 2017. ^ Croll, Ben (12 June 2017). "Even Neil Gaiman Was Surprised by the Reaction to 'American Gods'". Variety. Retrieved 12 August 2017. ^ Patten, Dominic; Andreeva, Nellie (29 November 2017). "'American Gods': Michael Green & Bryan Fuller Exit As Showrunners Of Starz Series". Deadline. Retrieved 30 November 2017. ^ Dornemann, Rudi; Kelly Everding (Summer 2001). "Dreaming American Gods: an Interview With Neil Gaiman". Rain Taxi Online Edition. Rain Taxi, Inc. Retrieved 28 September 2009. ^ "Neil Gaiman Responds". Slashdot. 3 November 2003. Retrieved 18 November 2018. ^ Gaiman, Neil (25 September 2001). "Neil Gaiman – September 2001". Neil Gaiman's Journal. Archived from the original on 10 December 2006. Retrieved 3 January 2007. ^ "Interview with Neil Gaiman". Shadow Writer. 2005. Archived from the original on 21 October 2016. Retrieved 18 November 2018. ^ Gaiman, Neil (28 February 2008). "Kids! Free! Book!". Neil Gaiman's Journal. Archived from the original on 2 March 2008. Retrieved 29 February 2008. ^ "2001 Award Winners & Nominees". Worlds Without End. Retrieved 5 August 2009. ^ Flood, Alison (4 May 2010). "'One Book, One Twitter' launches worldwide book club with Neil Gaiman". The Guardian. Archived from the original on 2 June 2012. Retrieved 18 November 2018. ^ Gaiman, Neil (5 May 2011). "Neil Gaiman's Journal – May 2011". Neil Gaiman's Journal. Archived from the original on 24 June 2011. Retrieved 15 July 2011. ^ Sava, Oliver (23 January 2017). "Neil Gaiman's American Gods comes to comics in this exclusive preview". A.V. Club. Retrieved 18 November 2018. ^ "American Gods Volume 1: Shadows HC". Dark Horse Comics. Retrieved 18 November 2018. ^ Goldberg, Lesley (1 July 2014). "Starz, Bryan Fuller Board Neil Gaiman's 'American Gods'". The Hollywood Reporter. Retrieved 18 November 2018. ^ Petski, Denise (2 February 2018). "'American Gods' Hires New Showrunner For Season 2". Deadline Hollywood. Retrieved 18 November 2018. ^ Marshall, Rick (22 June 2011). "Neil Gaiman Reflects On 'American Gods,' 10 Years Later". MTV News. Archived from the original on 14 June 2012. Retrieved 18 November 2018. ^ Flood, Allison (1 September 2014). "Neil Gaiman brings American Gods back to life". The Guardian. London. Gaiman, Neil (1 March 2007). "More Mysteries of the Oracle". Neil Gaiman's Journal. Retrieved 3 January 2007. This page is based on the Wikipedia article American Gods; it is used under the Creative Commons Attribution-ShareAlike 3.0 Unported License (CC-BY-SA). You may redistribute it, verbatim or modified, providing that you comply with the terms of the CC-BY-SA.